I absolutely love J.J. Heller. You will do best to watch this clever (yet touching) video in full-screen mode. Holy God, who has filled me with the joy of your grace and salvation, assist me this day that I may do all things I am called to do without grumbling or disputing. I call on your Spirit to assist me, that I may be blameless and innocent, a child of God without blemish in the midst of a crooked and twisted generation. 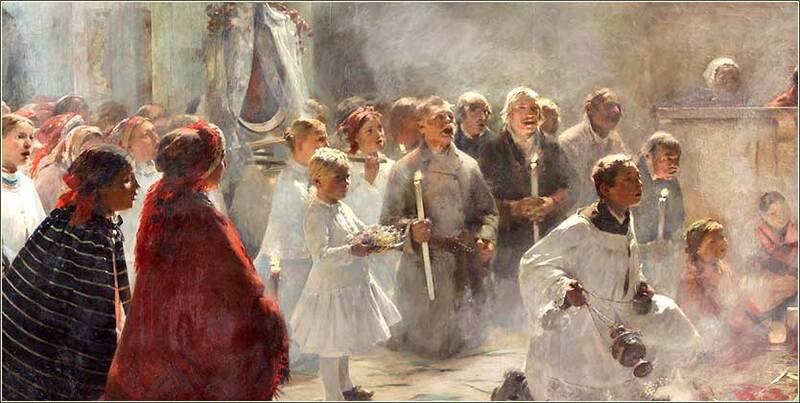 Let me follow holy Christ and all his saints: Let me shine as a light, a beacon in a world where darkness seeks to overcome us in every thing and at every moment. And help me to hold fast to the word of life, so that in the day of Christ's return I may be proud that I did not strive in vain. In the year 170 [142 B.C.] the yoke of the Gentiles was taken off from Israel. . . . In those days Simon [Maccabeus] besieged Gaza . . . . And they cried to Simon for peace, and he granted it to them: and he cast them out from thence, and cleansed the castle from uncleannesses. And they entered into it the 23rd day of the second month, in the year 171, with thanksgiving, and branches of palm trees, and harps, and cymbals, and psalteries, and hymns, and canticles, because the great enemy was destroyed out of Israel. Jesus fulfilled many specific messianic prophecies, but most often we do not see him doing it intentionally. Here, though, he goes out of his way to fulfill the prophecy of Zechariah, “Behold, your king is coming to you, humble, and mounted on a donkey . . . colt.” (Zechariah 9:9) Moreover, Jesus is making a Big Entrance. Where he has usually sought to avoid crowds, now he embraces them. Riding a donkey colt is theatrical; it is an intentional show, and halfway a parody of the triumphal march of a Roman victor. Even closer, Christ mimics the triumphal march of Simon Maccabeus, the brother of the great Judah Maccabeus, into Gaza. The specific of the palm branches laid in his path were not lost on the early Jewish Christians, and should not be lost on us. Around 175 B.C. Jerusalem had fallen to the Syrian (SeleucidThe Seleucids were one of the divisions of the empire of Alexander the Great, after his death.) king, Antiochus Epiphanes, and he had been determined to stamp out Judaism. He set a statue of Zeus on the Temple's altar and turned its rooms into a brothel. The Maccabees reconquered Jerusalem and much of Canaan. The Sadducees were actually the inheritors of the Maccabean revolution; they believed that the “Messiah” predicted by the prophets was an ongoing process, begun by the Maccabees, that would cast out foreigners and re-establish the most ancient interpretation of Mosaic Law. So it was they who most fervently anticipated a messianic entry into Jerusalem, by a Jew riding a charger at the head of a victorious army, coming to cleanse the Temple. Thus, Jesus riding a donkey colt is loaded with implications. 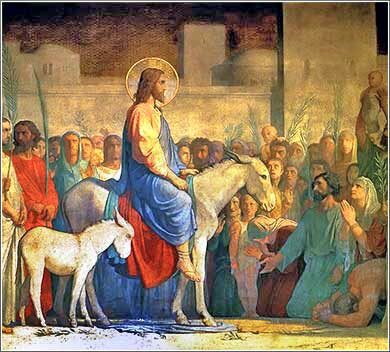 Here is your conquering King, Israel: a scruffy and impoverished holy man, who preaches peace and sacrifice, not in shining armor, but the tunic of a working man — and riding a small donkey. Yes, he is coming to cleanse the Temple, but it is you, the religious leaders of Judaism, from which it will be cleansed! The cries of “Hosanna” and “Hosanna in the highest” are often misunderstood. The word means hosanna means “save now”. It is more a plea than a joyful shout of celebration. It is somewhat similar to the British “God save the King”, with “the King” standing as the symbol of the nation. “Hosanna to the Son of David” thus asks Christ to save Israel, but implicit in it is a recognition (or hope) of His ability to do so and his right to lead. “Hosanna in the highest” asks the angels in heaven pray to God for the salvation of Israel.